The so-called "Comet of the Century" is about to have its much anticipated brush with the Sun — the results of which could be visible to the naked eye. Thankfully, NASA is tracking ISON's journey in realtime, and here's how you can watch the drama unfold. 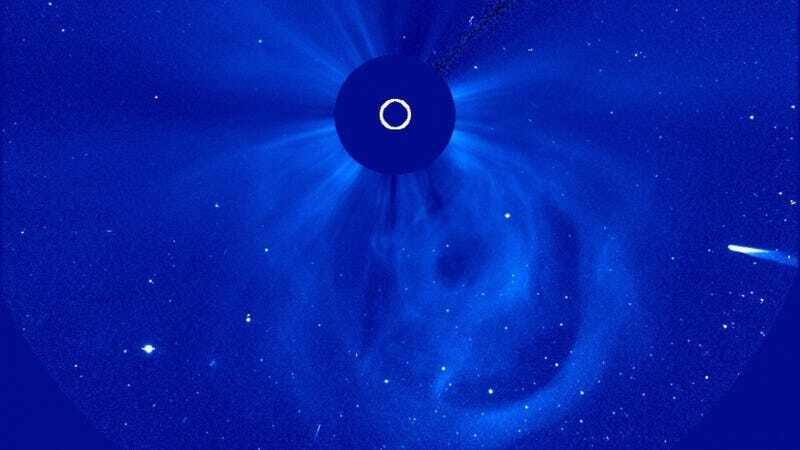 Scientists say Comet ISON is already starting to buckle under the pressure and it may not survive. The Sun's gravitational pressure and heat could cause the object to disintegrate before it has a chance to light up our skies. Yesterday (November 27th), ISON entered the field view of the ESO/NASA Solar and Heliospheric Observatory (pictured above and featured in the video below). That cloud-like structure you see below the sun is the remnant of a coronal mass ejection.